One of the most popular styles, it comes in wool and man made fibres. Variously described as "Hardtwist", "Hightwist" or "Frise" the yarn has been given an extra turn or two and this results in a rougher surface texture which is less prone to showing footmarks. Sometimes called Velour. A close construction with a short pile and smooth top. Available mainly in tufted and Wilton constructions and in wool or synthetic fibres. A shorter pile length than shag pile, the tufts tend to be closer together. Saxony styles are available in several different fibres. Mainly available in natural and "Berber" colourways. 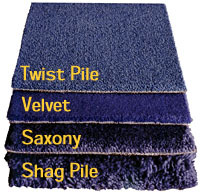 Today shag piles are designed for luxury and decorative use. In the main they come in heavy weights and would look superb in your penthouse.